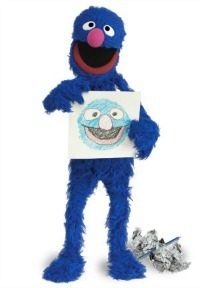 Grover Takes Over Sesame Street's Twitter Feed With Adorable Results. Every kiddo's favorite blue furry monster took over Sesame Street's Twitter feed last week. Indeed, Grover warned his followers in his initial post, "There is a MONSTER at the end of this Twitter conversation." The ensuing tweets were a play on the classic book, There Is a Monster at the End of This Book. The silly monster with klutzy tendencies soon added, "And we do not want monsters on Twitter, now, do we?" To avoid continuing the conversation, the beloved Sesame Street character warned followers to stop retweeting his content! Again and again he begged fans to cease the back and forth that would inevitably lead to the terrifying monster he fears. This is the end of the conversation and the only one here is ME!" Whew! In the end, it seems even the clumsy furry Sesame Street character is keeping up with the times. Every kiddo’s favorite blue furry monster took over Sesame Street‘s Twitter feed last week. Indeed, Grover warned his followers in his initial post, "There is a MONSTER at the end of this Twitter conversation." The ensuing tweets were a play on the classic book, There Is a Monster at the End of This Book. The silly monster with klutzy tendencies soon added, "And we do not want monsters on Twitter, now, do we?" To avoid continuing the conversation, the beloved Sesame Street character warned followers to stop retweeting his content! Again and again he begged fans to cease the back and forth that would inevitably lead to the terrifying monster he fears. As fans of the childhood story will recall, the scary monster at the end of the story is none other than Grover himself, who is later embarrassed by his own folly. And like the book, the Twitter conversation follows the same ironic path. "Well… look at that. This is the end of the conversation and the only one here is ME!" the relieved little guy tweeted along with a photo of himself holding a self-portrait. Whew! That was close! It seems the sweet little monster worked himself up for no reason. But in the process, he got a ton of attention. His post revealing himself as the monster got over 1,200 retweets and was favorited by over 600 people. Before bowing off of Twitter, the blue dude admitted he was quite embarrassed by his social media misunderstanding. Don’t worry, Grover! This virtual trip down memory lane was fun for parents and silly for their tots. In the end, it seems even the clumsy furry Sesame Street character is keeping up with the times. In an age when tykes spend just as much time online as they do in the pages of books, your Twitter takeover was well conceived!